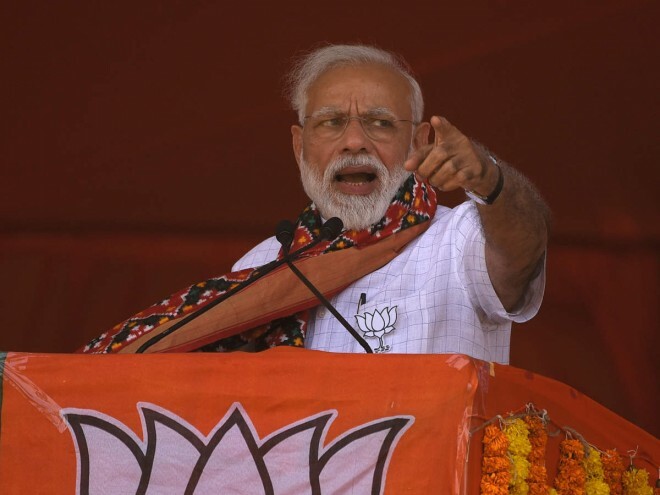 Kurnool, Mar 30: In a biting attack on Andhra Pradesh Chief Minister N. Chandrababu Naidu for promoting his son into politics, Prime Minister Narendra Modi on Friday urged people to vote for 'son-set' to ensure 'sunrise' of the state. Launching BJP's campaign for April 11 elections to Andhra Pradesh Assembly and all 25 Lok Sabha seats in the state, he said he was sure that there will also be sunset of corruption in these polls. Modi hit out at the Telugu Desam Party (TDP) chief for regime politics and corruption. He alleged that the schemes in the state were designed for scams. The Bharatiya Janata Party (BJP) leader, who earlier initiated the campaign in Telangana and targeted its Chief Minister K. Chandrashekhar Rao for dynasty politics, voiced concern over the trend dominating the country. He said be it TDP, YSR Congress (or) Congress, he was fighting against this mindset. Listing out the Central institutes sanctioned for the state and works done by the Centre during last 5 years, Modi said if had he got co-operation from the state government, he would have done more. "I did my best but those in power have no intention to develop Andhra Pradesh," he said targeting Naidu, whose TDP walked out of BJP-led National Democratic Alliance (NDA) government in 2018. Calling Naidu 'U-turn Babu' Modi alleged that there was corruption in developing the new state capital and various other projects. "People know what are the tricks being played and whose coffers are being filled. When your chowkidar raised questions and held him to account, 'U-turn babu' took U-turn from the promise of developing Andhra Pradesh and distanced himself from NDA." "U-turn Babu found friends who are on 'bail-gadi' and treading the path where Pakistan is treating them as the hero," said Modi. He also accused the TDP chief of spreading lies for vested interests and to hide his failures. Pointing out that the TDP and the Congress-ruled Andhra Pradesh for decades and Naidu was the Chief Minister for a long time, he said they neglected farmers and cited Polavaram as a living example. "The project is being built for seven decades. Our government released Rs 7,000 crore but this project remained incomplete as the state government is going on increasing the project cost," he said.